085. C.E. BORCHGREVINK. Issued by Hassan Cork Tip Cigarettes (American Tobacco Co.). (1914). 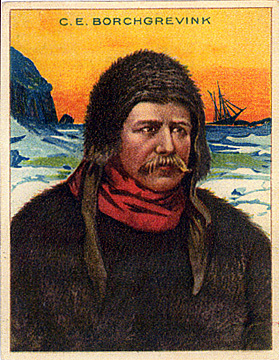 Card unnumbered; from a set of 25 entitled "The World's Greatest Explorers". Size: Ca. 2.5" x 3.2". Recto: Portrait of Borchgrevink with Antarctic scene and ship in background. At top center: C.E. BORCHGREVINK. Verso: THE WORLD'S GREATEST EXPLORERS | C.E. BORCHGREVINK | Carsten Egeberg Borchgrevink was born in Christiana, Norway, in 1864. He was educated in Christiana and at Gjertsen College, and graduated from Royal College in Saxony. In 1888 he emigrated to Australia, where he worked for six years as surveyor in Queensland and New South Wales, taught languages and natural science in Cooerwull College, founded Cooerwull Museum, and ascended Mount Lindsay. He went to the antarctic on a whaling vessel in 1894, and commanded an expedition in 1898-00, reaching latitude 78° 50', the farthest south up to that time. He was scientific delegate of the National Geographic Society on the tour of the Dixie through the West Indies to investigate volcanic conditions in 1902. --Albert Operti, F.N.A.G.S. | HASSAN CORK TIP CIGARETTES The Oriental Smoke. THE LARGEST SELLING BRAND OF CIGARETTES IN AMERICA. FACTORY NO. 649 1ST DIST. N.Y.